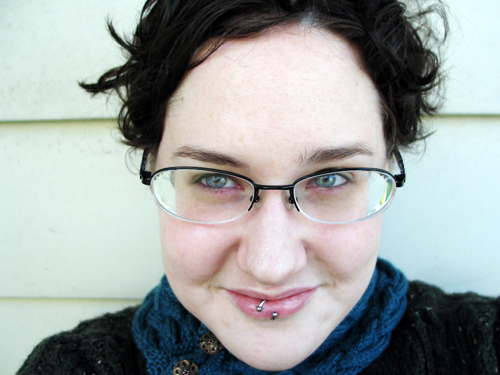 Jesh is a twenty-one year old knitter, spinner, and occasional crocheter. She likes knitting socks and lace and anything instant gratification. She doesn’t believe in cleaning out her room or her stash. She likes talking about herself in the third person. She can leap small ottomans in a single bound. She thinks you could probably learn more about her by reading her posts than from a silly little ‘about’ page. Jesh can also be seen at knittyboard, Ravelry, Etsy, Plurk, and Twitter as Jesh, because she is creative like that. I just randomly stumbled on your blog..YOU are SO clever!! Keep on being…wow!!! “hot dish” dye instructions on the way to you..a wisconsin secret soon to be yours..dye rainbow fleece or yarn in a roasting pan in the oven and eliminate the need to stir and scortch) on the stove top…………..snail mail only! i hope you don’t mind, i’m following your twitter feed and have found your cat stories quite hilarious. you see, i can relate, as i have two utterly lovely – and utterly spoiled – felines, a tabby girl (Maddie) and a smoky-chocolate Persian (Maximus). they both leave fur everywhere. it’s apparently how they mark their territory, which, considering the *other* way animals mark their territory, is fine with me. I wanted to order a couple of you spindles and was wondering if you shipped to France and if so what are the conditions.